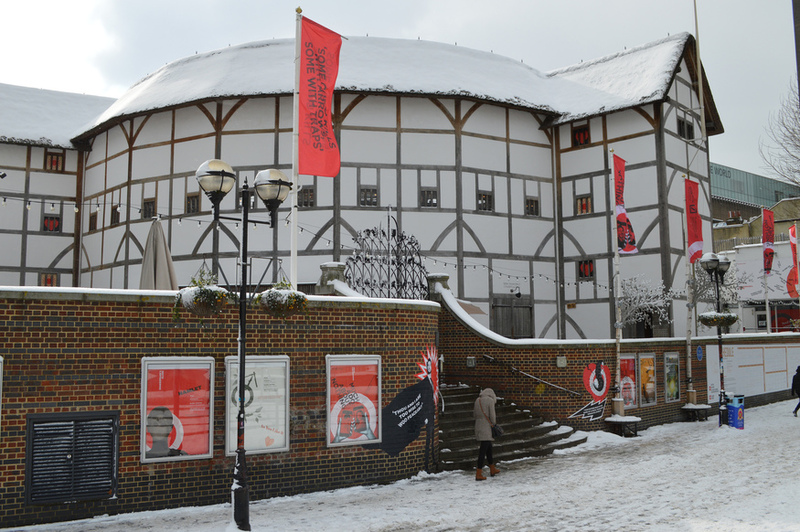 Shakespeare's Globe: the most prominent and entertaining memorial to the Bard. 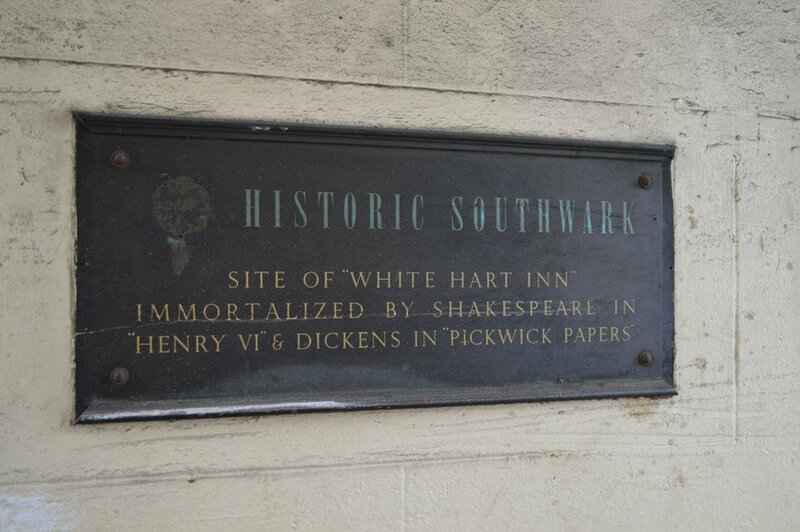 There are, no doubt, hundreds of memorials across town that quote or commemorate William Shakespeare — from the gate of Southwark's George Inn ('Shakespeare's local'), to an unmarked tree on Primrose Hill. Here are a few we've chanced upon during our years of wandering the city. 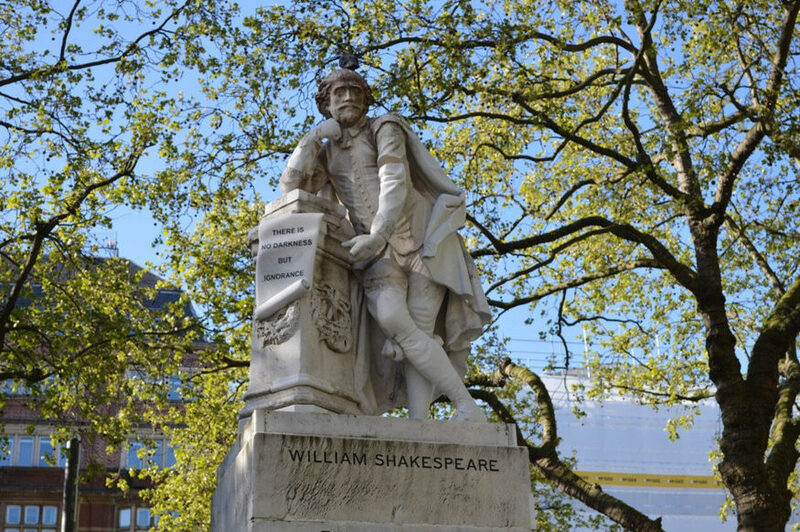 London's most famous Shakespeare memorial (if we don't count the Globe), is his statue in Leicester Square by Giovanni Fontana. It has stood here since 1874, a copy of an older statue in Westminster Abbey. 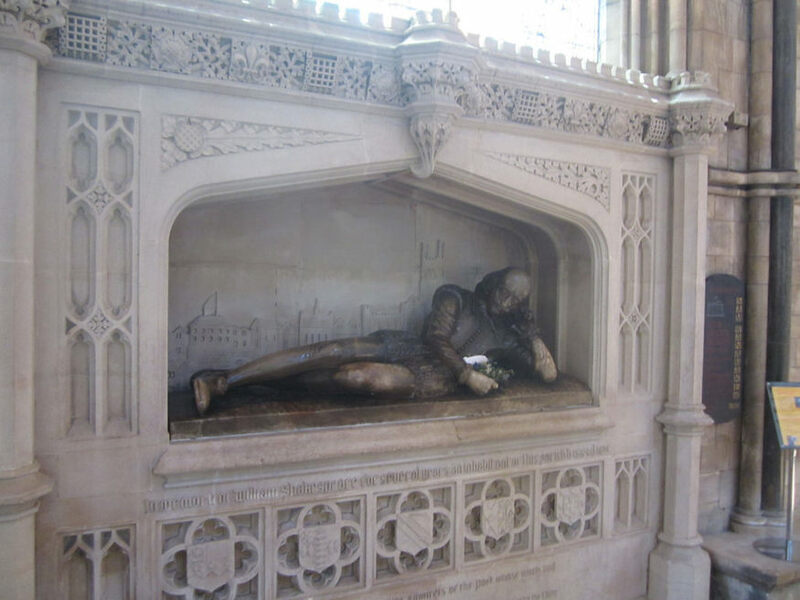 This memorial to the Bard can be found in Southwark Cathedral, beneath a stained glass window that features some of his characters. A monument to his brother Edmund can also be found hereabouts. 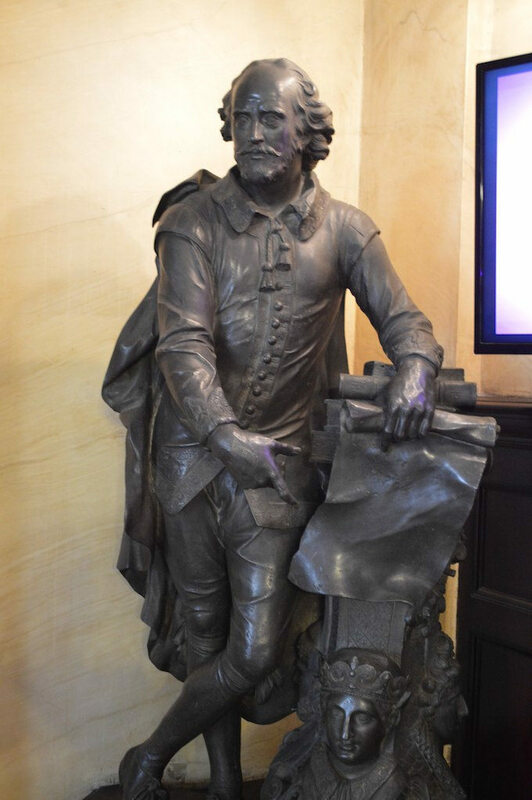 A further statue to Shakespeare stands inside the Theatre Royal, Drury Lane... next to Noel Coward. To a close approximation, six billion pubs are named after Shakespeare. Which is as it should be, for the Bard frequently mentions inns and taverns in his works. More stained glass. 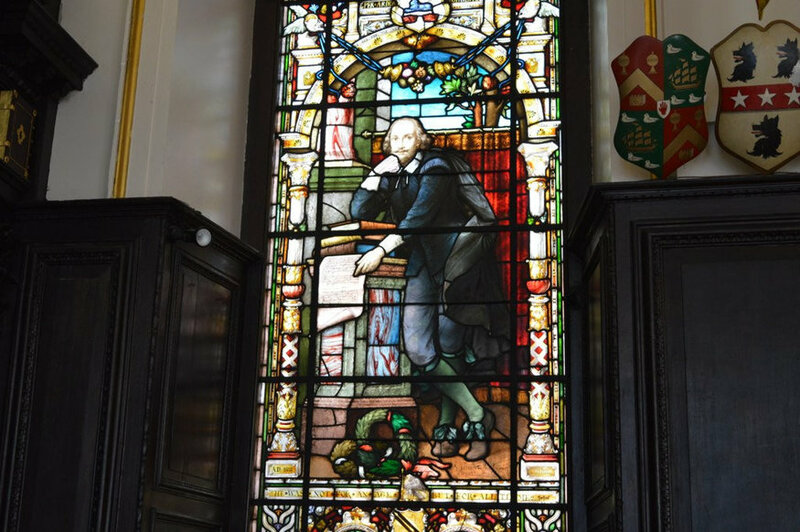 This window adorns Stationers Hall near Ludgate, close to Shakespeare's only documented home. 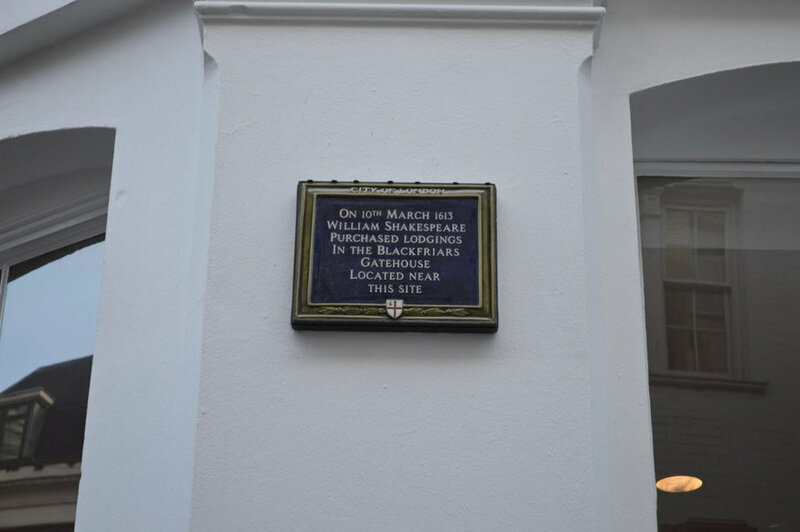 The probable location of that home, in Blackfriars, is marked with a City of London plaque. Find it beside The Cockpit pub. A similar plaque marks Will's former lodgings in Noble Street. 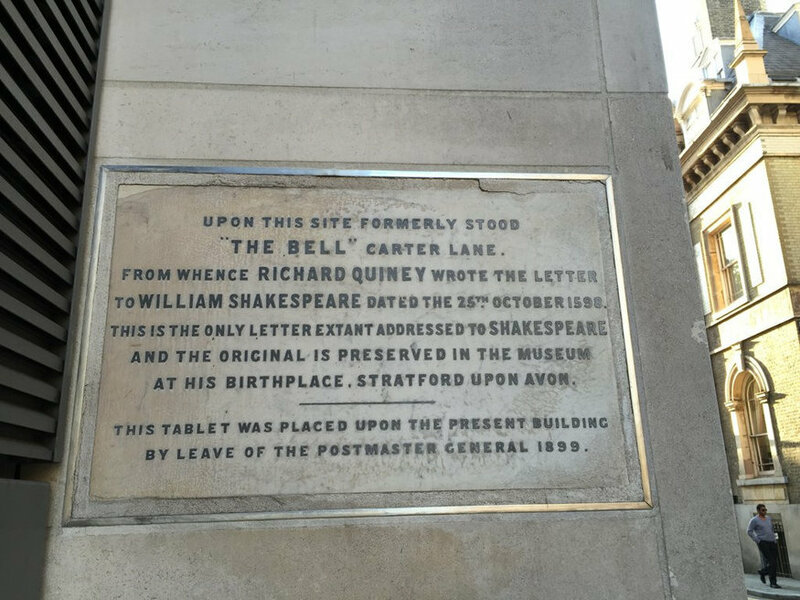 Nearby on Carter Lane, this wordy plaque records the only documented letter to the Bard. 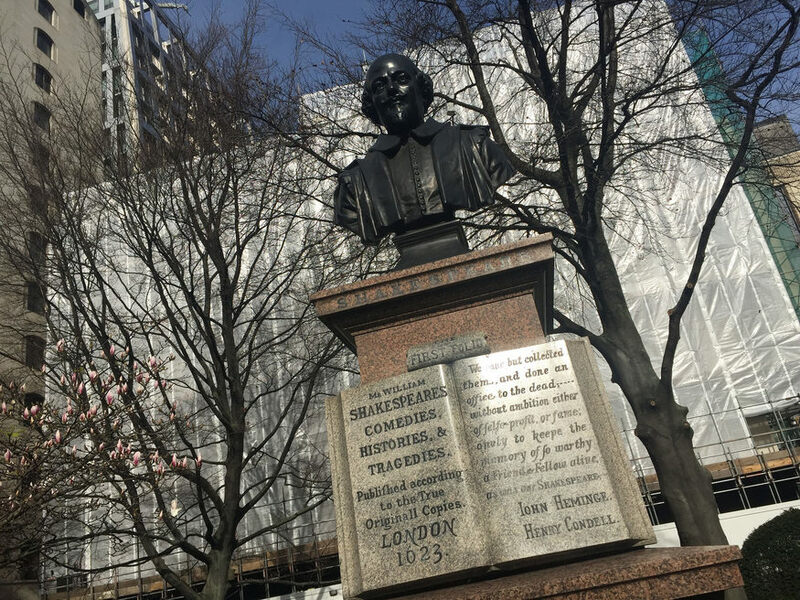 Elsewhere in the City, this bust of Shakespeare is in the former churchyard of St Mary Aldermanbury. It really commemorates two early Shakespearean actors, John Heminges and Henry Condell. 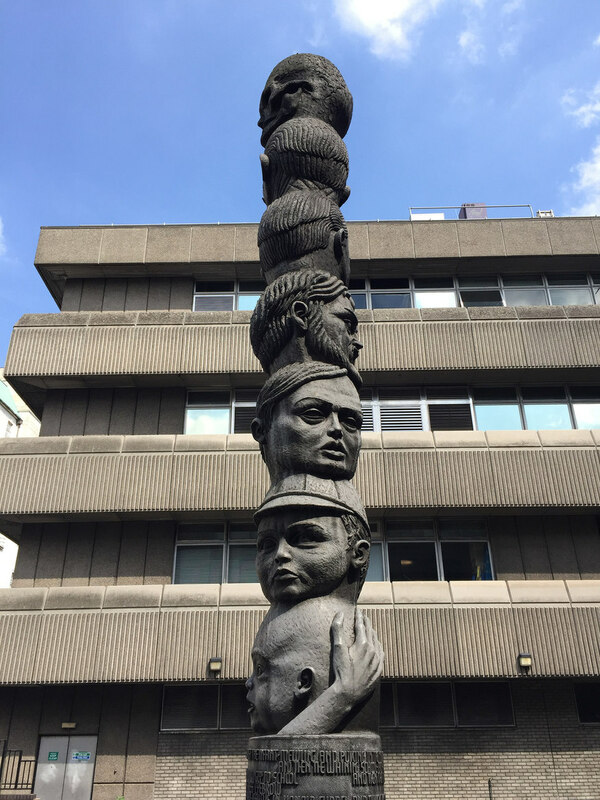 More Shakespearean heads, this time a sculpture called The Seven Ages of Man, inspired by the notion in the 'All the world's a stage' monologue. Find it hiding on a raised walkway near Blackfriars station. The modern Globe does not stand on the precise spot of its Elizabethan inspiration. For that, head round the back to Park Street, where a curving pavement line and plaque mark the hallowed ground. 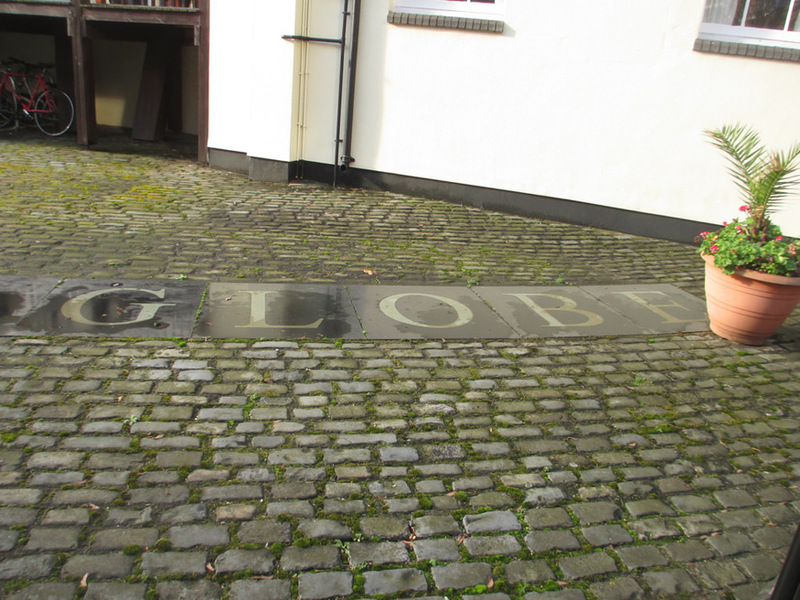 Even that's not the original site of the Globe. The structure originally stood in Shoreditch, off Curtain Road, where it was known as The Theatre. 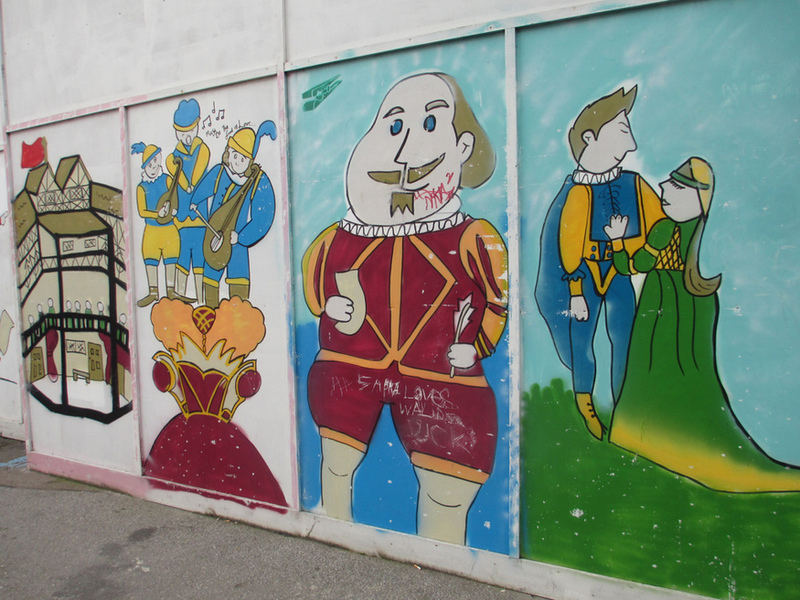 The site is marked by some cheery hoardings and street art. Further south on Curtain Road stood another Shakespearean theatre called The Curtain. Its remains are preserved beneath a new skyscraper development. Meanwhile, the spot is commemorated by this curious bit of street art. 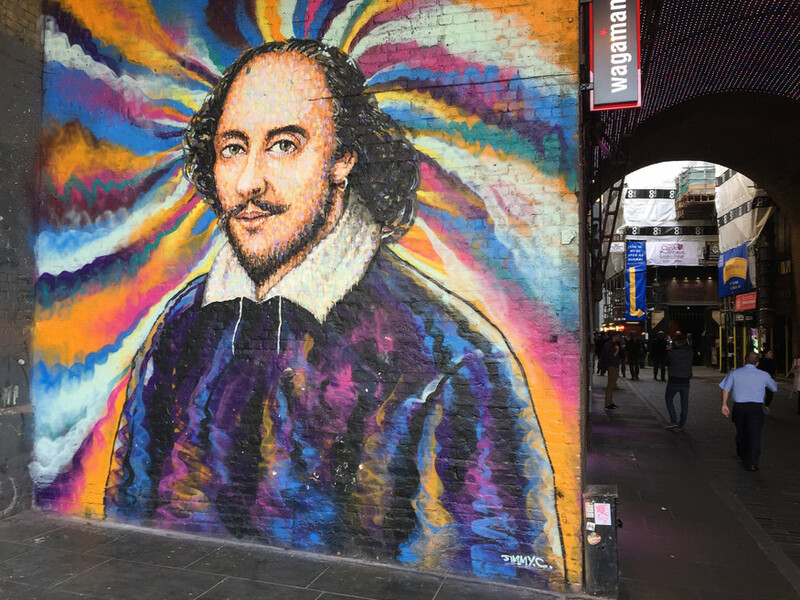 Meanwhile, the most Instagrammed bit of Shakespearean street art must be this JimmyC mural under the rail arches of Borough Market. 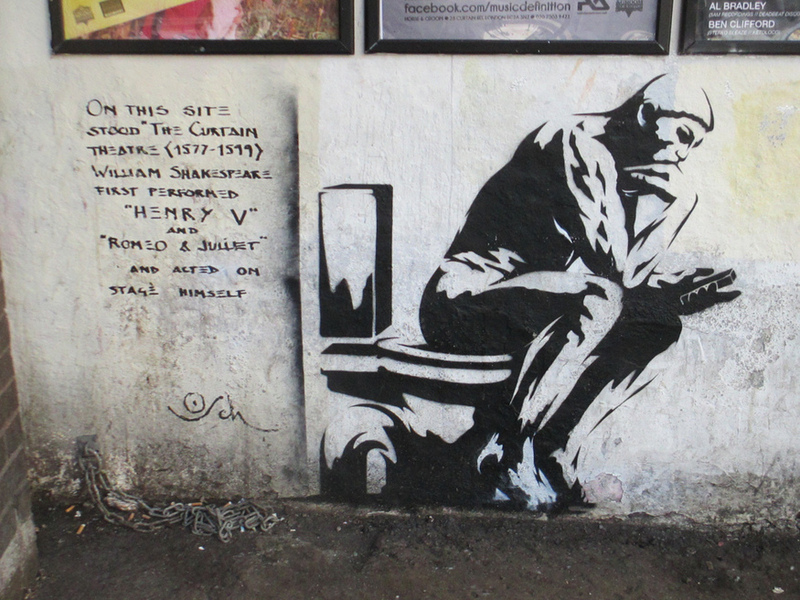 Shakespeare quotes appear all over town, and we can't be in any way exhaustive. 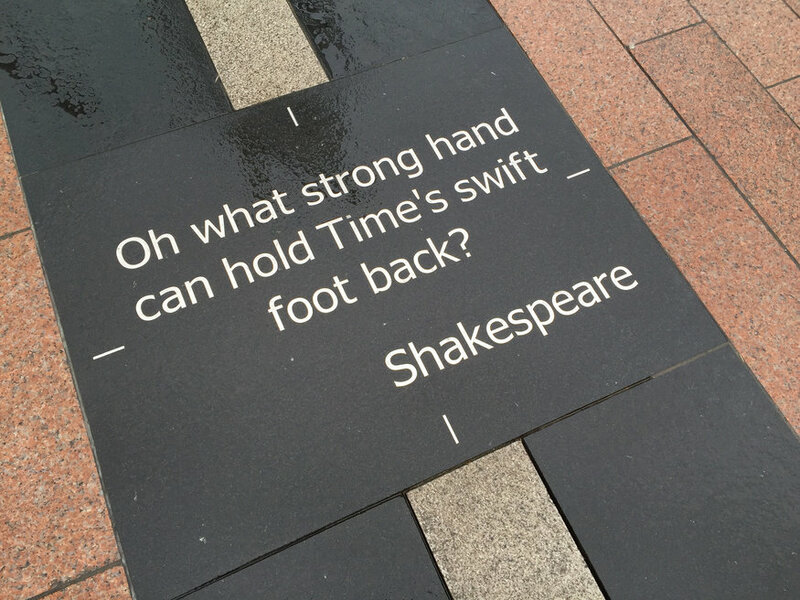 Here's a pertinent bon mot from the Prime Meridian in North Greenwich. 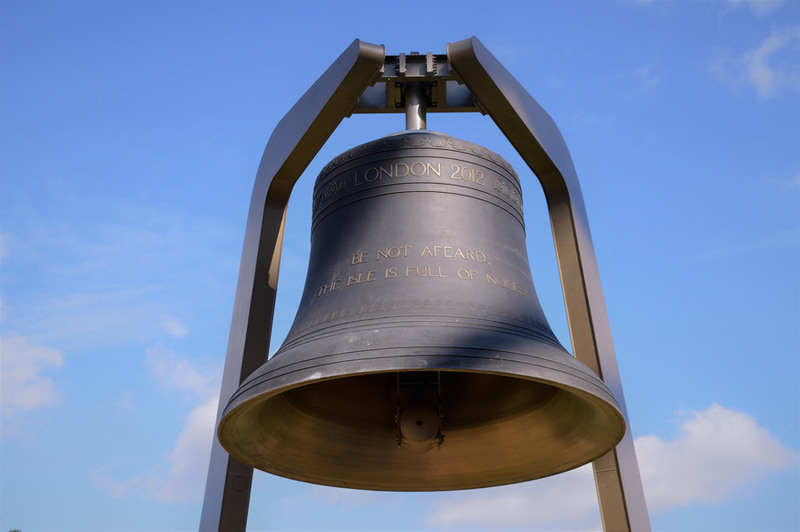 While across the water, the Olympic bell is inscribed with a line from The Tempest: "Be not afeard, the isle is full of noises". All images by the author. Please do use the comments to highlight other memorials around town... there are many more.